Greetings from Huong, Ella, and Kaylee from The 88 Project! We are bringing you news, analysis, and actions regarding human rights and civil society in Vietnam during the week of July 10 to 16. News broke that land and labor rights advocate Tran Thi Nga, who was arrested in January 2017, will face trial on July 25 and 26, charged under Article 88, the same Criminal Code provision as Nguyen Ngoc Nhu Quynh (Mother Mushroom). There have been developments in land rights, international policy, and internet freedom. An article in The Diplomat makes the case for Vietnam adopting improved labor standards despite no longer working with the U.S. to ratify the Trans Pacific Partnership. This week also marks the four-year anniversary of adoption of restrictive Decree 72 in Vietnam. Please take action for Mother Mushroom, as she enters her third week of a ten-year prison sentence. Migrant, land, and labor rights advocate, Tran Thi Nga, who was arrested January 21, 2017, will go to trial under Article 88 on July 25 and 26 for the posting of online content. She is well-known for her activism to support migrant workers, trafficked persons, and environmental causes. She has two young children. She has been in poor health while detained, resulting from a confrontation with police in 2014, and was not allowed to see her lawyer until May. She is facing up to 20 years in prison. Her trial follows that of another female prisoner of conscience, Nguyen Ngoc Nhu Quynh (Mother Mushroom), who was sentenced to 10 years in prison on June 29. A soccer team made up of many activists, bloggers, and other community members has been facing harassment from authorities, including interference during matches. The team was mentioned in a recent New York Times article about dissent in Vietnam the age of social media. Benedictine Catholics in Vietnam report that the country has stolen land from them to sell off, the latest action in an ongoing dispute over land rights, including a violent confrontation last month. Vietnam says officials have agreed to meet with the priests regarding the disputes. The Vietnamese government, YouTube, and Facebook have eliminated 3,000 clips and 600 accounts after labeling them as “slanderous” to the state. Those two companies, plus Google, account for the majority of advertising earnings in the country. Will TPP’s Death Kill Labor Rights Reform in Vietnam? : “In its labor side agreement with the United States to implement the Trans-Pacific Partnership (TPP), Vietnam committed to incorporate those international labor standards into its legal system and implement them in practice. For the TPP to take effect, the revision of the Labor Code was put on the agenda of the National Assembly to bring domestic law into conformity with the requirements of the TPP. However, when the United States withdrew from the TPP, labor rights reform was delayed. In this context, many people argued that the need for labor rights reform is gone because there is no more demand for reform from the United States. 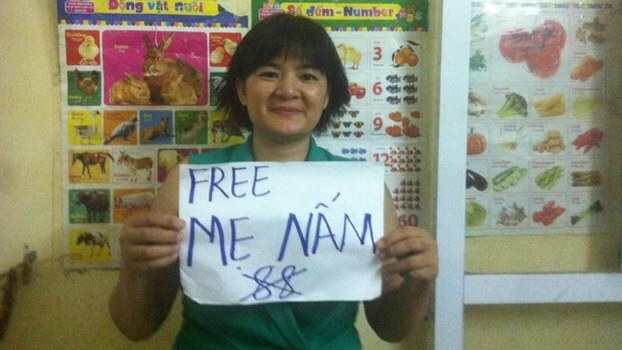 Young activist Tran Hoang Phuc, 23, has been arrested under Article 88 for Internet postings. He was detained on July 3. He was supposed to meet with US President Obama last year as part of a U.S. government youth development program, but he was prohibited by police from attending the meeting. He now awaits trial in detention. This week marks four years since a major law was enacted in Vietnam. On July 15, 2013, Decree 72 was adopted, placing even more rigid restrictions in Internet usage in the country. Please also take Amnesty International’s Urgent Action for her, as she is being held in incommunicado detention. Support is needed for her appeal.